Some of our neighbours down the street have been landscaping, and as part of this somehow they dug up some dirty chunks of wood. I have no idea what they were part of, but they gladly gave them to us rather than take them to the dump. The kids helped us pile them in the car and we drove them up the street and hosed and scrubbed the mud off. Here they are all scrubbed clean. They are in poor shape, but still really interesting, especially the ring patterns that have kind of weathered to be really prominent and will probably be great for crayon rubbings! Once they had dried out fully the kids had a go at them with the sander. This was their first time with an electric sander and they really liked it! Then the kids had at the blocks with a load of kiddy paint in yoghurt pots and some big brushes. They kept at this for a good long time, especially my four year old. I'm hoping that the neighbours chuck out more lumber as they keep landscaping, because the bigger the collection of building parts, the more exciting projects the kids can come up with. I don't really have any set ideas of what to do with these blocks. So far the kids have built towers and stepping stones and bridges with a couple of other bits of wood we have. Sometimes the free section of craigslist calls out to me. It's a good job we don't have a truck, or I'd be trying to grab all the wooden furniture from the curbsides around here! Wonderful idea! We are renovating at the moment, I now know what to do with all the wood odds and ends lying around! LOVE this post, and the idea is fantastic. My sister's getting an addition put on her home, and you better believe I'm on the phone in a sec asking her to keep her tiny wood scraps for us! I LOVE it! I am hoping putting your blog in my RSS feed thing will get me busier making neat things for my kids! I have been slacking this past year with that. Oh and I feel the same about the pickup truck. These look so fantastic painted! They did a great job. I will be on the lookout for wood scraps too. What a great idea. You guys are amazing. Thanks for all your ideas - they are great fun! 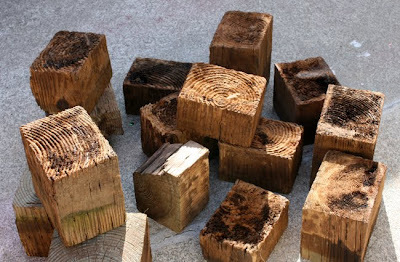 I know I'm a worry-wart, but you may want to make sure it's not pressure-treated wood or old railroad ties, both have nasty chemicals in them to keep the wood from rotting and to kill any wood-boring insects. Kids touching or breathing in the sanding dust from such wood is not good. Normal lumber for building a house, like pine 2x4 is untreated and thus safer. This is fantastic, and looks like so much fun! Thanks for all your great ideas, I enjoy reading your blog. Those are so cool! I would have loved these when I was a kid. SO many possibilities... Thanks so much, I'll be linking. That is one sweet find, KM! And the kids did an incredible job painting them. I just wanted to thank you for the constant inspiration. I think of you often when I am repressing my "don't make a mess!" voice, and letting the learning come through beautiful chaos, hope, and love! I know I'm repeating others a lot here - but these are so cool. I saw some things called tree-cakes on a blog somewhere (wish I could remember where?) 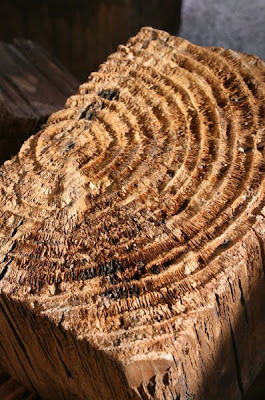 which were basically a lopped tree-trunk sliced into pieces of a few centimetres. 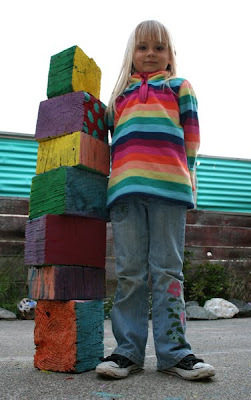 Similar idea as yours - great for tower building. I've been on the lookout for a lopper working in the neighbourhood ever since. Wowee how fabulous are those blocks. Why oh why have I not thought to do this before?! I love the paint job. Well done gang! 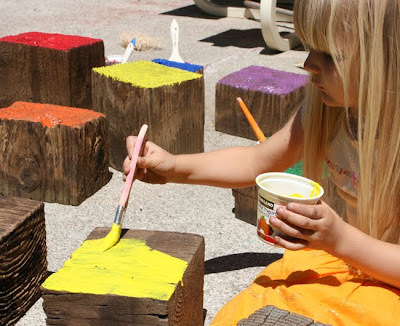 I LOVE these wooden blocks!!!!!!!!!! Those blocks look really cool! 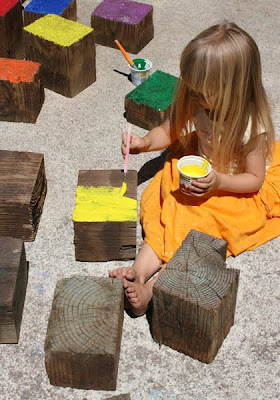 Now my eyes are going to be on the look out for giant pieces of wood to turn into blocks...how fun are those!!! Brilliant idea!!!! (insert round of applause for wonderful creative mammas)!!!! honestly, you need a book deal or a show. you do the coolest things. Dude. I'm totally jealous that I didn't think of that first! And disregard the part in the email I just sent you about Teacher Tom and his wooden snake thing. I just found the link to it through the other comments. So cool! 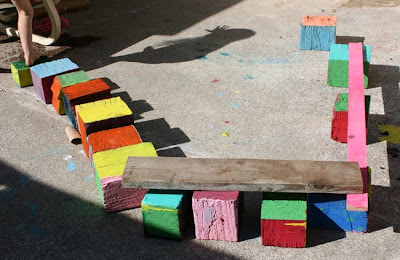 I'm going to have to ponder that and put it to use somehow with the log blocks I made for our kids. Stop to be a genius! Wow! So creative! Thanks for the idea! Mind if I borrow it? Holy mackerel thats cool! I want some! I think my girls would love it. I also like that you hauled out the sander and let them use it! Start 'em early! What a fantastic idea. I love it when moms are inspired to make toys for their kids! 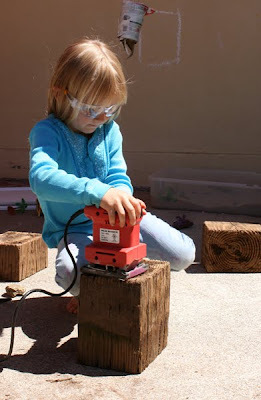 I can't wait for my little one to be old enough to use power tools to help me make toys. I heard redwood dust might be toxic to inhale even if it is untreated. 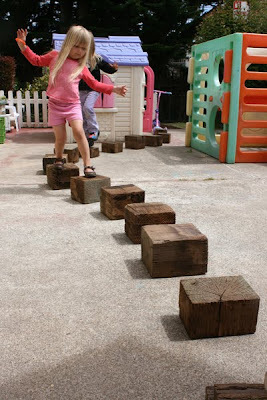 I plan on making tree limb blocks next month and we used large tree trunks to create all kinds of play structures in our yard. Do you have a local FreeCycle. That is where I get my best stuff So glad I stopped by. 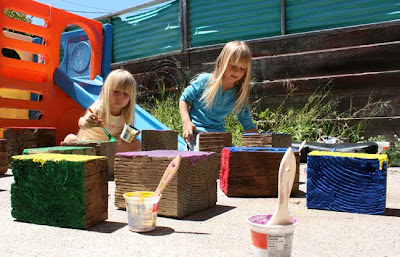 Please visit my blog and check out my "projects"
easy toys moms can make! Oh my that looks like so much fun! 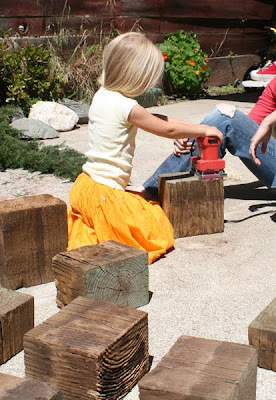 I love that your kids get to use tools like the sander and you encourage so much creativity in them. It's inspiring! This is such a fabulous idea. We just finished building a fence, 2 garden beds and a play structure. So, there's a lot of wood pieces around here. I looked around a bit & I'm very inspired. I like that you had no idea what to do with the blocks. GREAT! That gave the kids the freedom to think up some possibilities, which I see were many. 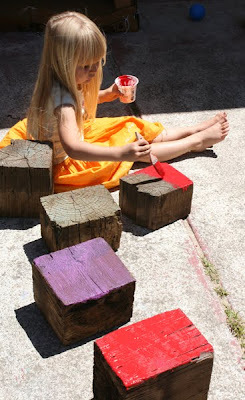 It's so cool for kids to work with materials other than just paper paper paper. Nice job! 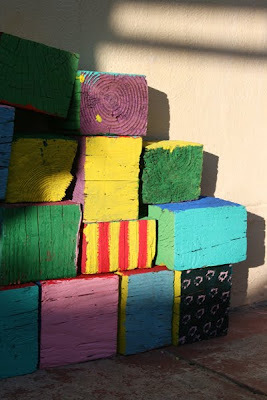 The blocks are fabulous, I think they look like works of art you would find in a modern art gallery! This is fantastic! I've linked to this on my weekly blog linking party and will share it with my readers on Sunday, would love to see you there too! (Sunday thru tues) All the best! I LOVE this! Really amazing!! these are great! 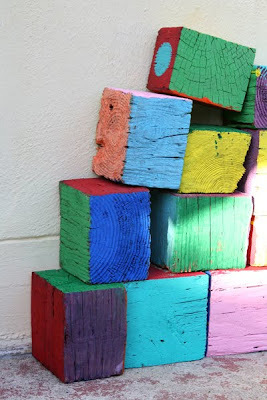 i love the bright colors, and just the idea of having huge outdoor blocks... wonderful!